At Lil' Rhubarb Shop BUY Frozen Rhubarb-Plants-Seed-Rhubarb Jam, more! 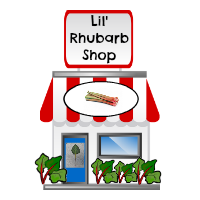 Here at the Lil' Rhubarb Shop, Rhubarb Central is pleased to offer you products that will help and inspire you to grow rhubarb and for those of you who do grow rhubarb, to continue growing this amazing vegetable. For those of you who do not grow rhubarb, here at this Lil' Rhubarb Shop are links to rhubarb products so that you can enjoy this delectable veggie too! Whether you are looking for rhubarb seeds, ornamental rhubarb seeds, rhubarb plants, frozen rhubarb, rhubarb pie fillings and jams, medicinal rhubarb products, or even rhubarb candy ... you can find links for all this, and more (!) for sale at this Shop. The products on this page are all available for online purchase from *Amazon.com. Rhubarb-Central.com is a participant in the Amazon Services LLC Associates Program, an affiliate advertising program designed to provide a means for sites to earn advertising fees by advertising and linking to Amazon.com. Be sure to click on the images for more detailed product information and helpful customer reviews of the products. For helpful information about growing rhubarb from seed, go here. For helpful information about ornamental rhubarb plants, go here. For helpful information about rhubarb plants, go here. For helpful information about using frozen rhubarb, go here. Thanks for Visiting the Lil' Rhubarb Shop!